Storm Misses Los Angeles. Trough Producing Some Rain & Snow. A Pacific storm system -- which at one point was expected to be the wettest of the rain season thus far -- took a more westward track and skirted the coast of Southern California on Christmas Eve, generally producing only modest rainfall across the area. Today, the trough digging down the coast is further west that forecast. (In retrospect this might have been foreseen taking into account the GWO phase 1-2 transition.) In any case, the flow into California has been moist and cyclonic, and rain has continued in many areas, with snow at the higher elevations. A front associated with this trough is working its way down the coast, and early this afternoon is just north of Los Angeles. This could add a little more to our rainfall totals as it moves through later today. We'll see! Update 12/26/08 10:30 am. Here are some preliminary storm totals from the NWS Los Angeles/Oxnard and storm totals from the NWS San Diego. 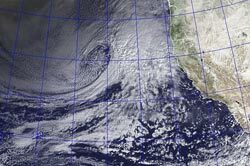 Potent Pacific Storm Takes Aim at California. A potent appearing Pacific storm system is developing off the coast of Oregon and Northern California and headed our way. Significant rain, with snow at the higher elevations, is expected over much of the state. Rain associated with this system is forecast to begin in Northern California this evening. At the moment, it looks like prefrontal rain could develop in the Los Angeles area tomorrow morning. Rainfall rates are forecast to increase Christmas Eve, and then taper off during the day on Christmas. Although the models appear to be converging on similar solutions, there has been a lot of variability from run to run. This is due in part to the difficulty of the forecast. The intensity of the low, the path of the low center, the amount of moisture available to the system, the upper and lower level jet dynamics and other factors could change the amount of rainfall. The HPC QPF forecast for the period Tuesday afternoon to Friday afternoon shows about 1.25 to 1.50 inches along the coast with up to about 3 inches in the mountains. These amounts could be somewhat understated. We'll see! The system that moved through the Los Angeles area Sunday night into Monday was a little stronger than expected, with rainfall amounts generally ranging from about 0.1 inch to 0.25 inch. Here are some preliminary rainfall totals from the NWS. 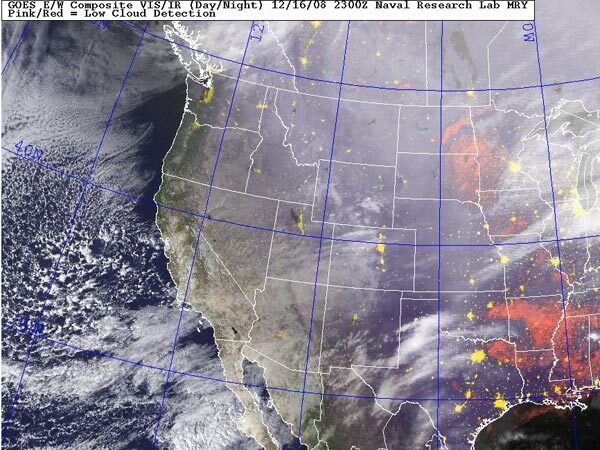 Update 12/24/08 11:00 am. 12z NAM and GFS forecast a more westward track of the low and have backed off precipitation amounts forecast for the Los Angeles area. The 12z NAM generates about 0.6 inch at Van Nuys and the 12z GFS only about 0.26 inch for the storm. HPC's latest 2-day Quantitative Precipitation Forecast indicates precipitation amounts ranging from about 0.75 inch to 1.50 inch in coastal Southern California. On the other hand, the 06z high resolution WRF-NMM was quite wet, with precipitation amounts in our area ranging from 1.0 to 4.0 inches. Rain, Snow, and Blustery Winds in Southern California. High Impact Weather for Christmas? 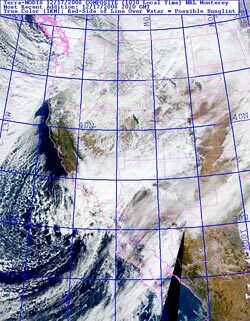 A cold upper level low produced widespread rain and snow in Southern California, closing highways, fouling traffic, and chilling Southlanders. As much as a foot of snow was reported in the Antelope Valley and the snow level dropped to near 2000 ft in the foothills and mountains of Ventura and Los Angeles counties. As forecast by the NAM/WRF, the precipitation totals were higher to the south of the Los Angeles basin. 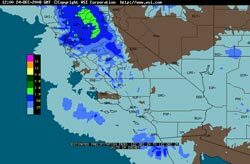 This Intellicast.com animated loop shows the pattern of rain and snowfall from Tuesday evening to Wednesday evening. Here are some preliminary storm totals from the NWS Los Angeles/Oxnard and storm totals from the NWS San Diego. Downtown Los Angeles (USC) recorded 0.51 inch for the storm, bringing the water year rainfall total at Los Angeles to 2.79 inches. As of December 17, this is 1.41 inches above normal, and 0.34 inch more rain than we had last year on this date. What's next? 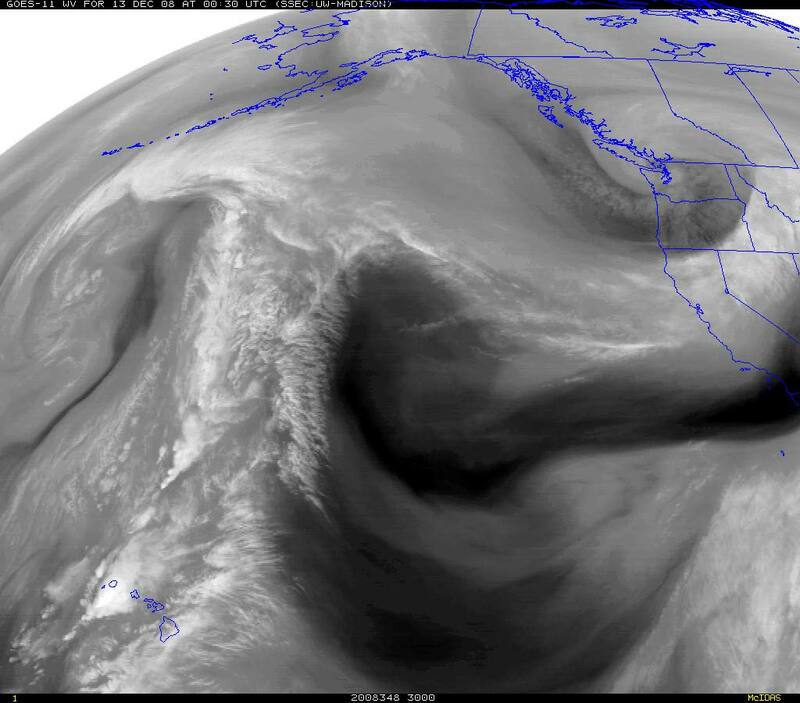 RAMDIS 4km water vapor animation shows a weak disturbance northwest of Pt. Conception, moving east toward the Central Coast. Although today's 18z NAM/WRF is dry overnight south of about Monterey, this area of vorticity could produce a shower north of Pt. Conception. After that, things should stay dry in Southern California until around Monday, when a fast moving front sweeps through the state. Later in the week, sometime around Christmas, the models are suggesting the possibility of a major system impacting California. We'll see! Back to Back Upper Level Lows. 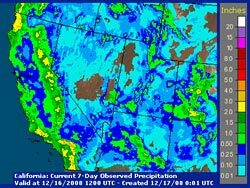 For Week Ending 12/16/08 4:00 a.m.
An intense upper level low, fed in part by moisture that originated in the subtropical mid-Pacific, produced widespread rain in Southern California, with snow at the higher elevations. Precipitation totals generally ranged from about 1 to 3 inches, and new rainfall records for December 15 were set at LAX, UCLA, Long Beach, San Gabriel and Santa Barbara. Here are some preliminary rainfall totals from the NWS. 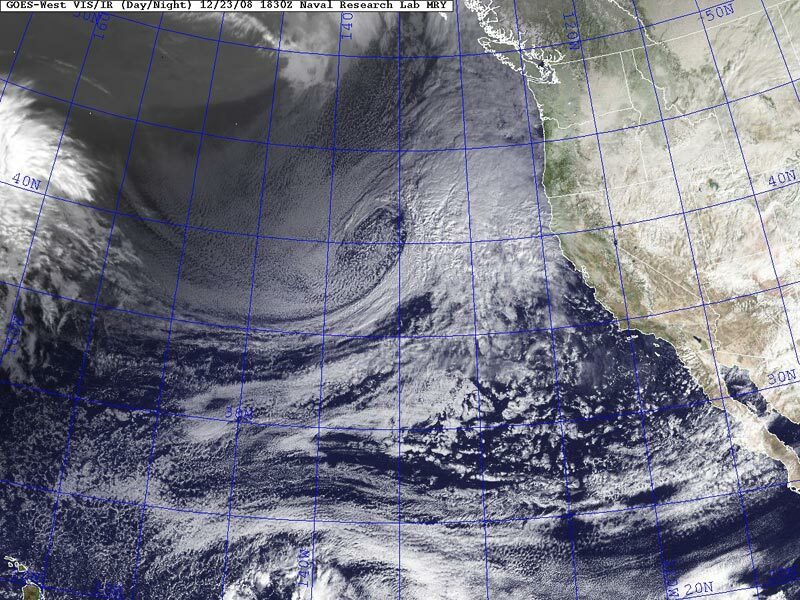 A very cold core upper level cutoff low is currently spinning off the California coast. A GOES sounding from this afternoon indicated a temperature of -33°C at the 500 mb level and significant instability. The low is forecast to move onshore over the next 24 hours, and slight changes in its trajectory could have a big impact on precipitation amounts and intensity. The NAM/WRF has been quite a bit drier in the Los Angeles area than the GFS, with the heaviest precipitation occurring south of the basin. The latest (00z) run of the NAM appears to be wetter in the Los Angeles area than runs earlier today. With such cold temperatures aloft, heavy rain and strong thunderstorms are a possibility, particularly wherever the low moves onshore. BUFKIT analysis of PMD and VNY data suggests the snow level could drop to 2000-2500 ft., perhaps lower in heavy showers. We'll see! Wintry Weather Expected in Southland. It's been a couple of weeks since an upper level low set rainfall records for the date at several Southern California locations, and pushed water year rainfall totals above normal at Los Angeles. Since then we've had almost no rain, and as of yesterday, Downtown Los Angeles (USC) rainfall has dropped to about six-tenths of an inch below normal. If a storm later this weekend works out as expected, we could be back above normal by Monday night. Several factors could affect the forecast. As we've seen earlier this season, the computer models don't do a particularly good job with high amplitude flows, retrograding ridges and digging troughs. Throw into the mix a strong 150-170 kt. jet stream, sub-tropical moisture being advected from Hawaii (nearly) to the Aleutians, and cold air being drawn down from Canada and Alaska, and there is the potential for high impact weather. A chance of showers is forecast Saturday into Sunday, but at the moment, the main event is forecast for Sunday evening through Monday. HPC's QPF for that period indicates rainfall amounts ranging from about 0.75 inch to 2 inches or more in the mountains. We'll see!